I’ve only recently started to understand why people use supermarkets and the benefits of a ‘one hit’ shopping experience – I now get that it’s all about time and convenience. In the past I’ve dismissed this argument, preferring to happily go food foraging for hours in the local shops across the whole of Walthamstow. I’ve found some gems over the years in the small shops and the market – the lifeblood of Walthamstow. However, now I’m getting a little stretched for time and sometimes more tired than I would admit. So I’ve decided instead of joining the carrier bag brigade to join the local organic vegetable box scheme, OrganicLea Community Growers, a co-operative based in Chingford. As I’m increasingly thinking of becoming vegetarian I went for the large vegetable box, but we still supplement it with extra from the market – old habits die hard. The large box costs £15 a week. There are various pick-up points every Wednesday across the borough and the scheme is being expanded as we speak. We rummage happily in someone else’s front garden for our bag of freshly picked and packed vegetables and skip home wondering what’s in it – although one of the foodies has had to confess prior knowledge as they publish the contents on Twitter and their website before pick up! Wednesday night is like ‘ready, steady, cook’, arguing on how to use the veg, which recipes to try, what to invent. 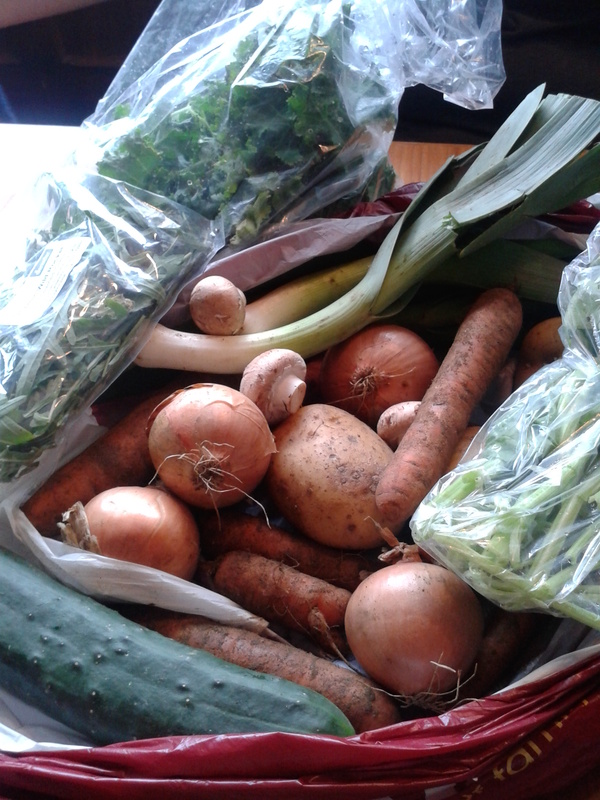 So we thought we’d share the contents of our ‘large veg bag’. The first week included a salad bag with the now famous Walthamstow Yellow Cress. Last week we had … Kentish baking potatoes and rocket; onions, carrots and leeks from Norfolk; local Chingford kale and Dagenham spinach, and mushrooms from Suffolk. The excitement from this batch of veg was home-made spicy kale crisps. This involved washing the leaves, removing the stems, chopping into 3 inch pieces, laying out in a single layer on a baking tray, spraying with oil, sprinkling with chilli flakes and salt and baking for 15 mins at 180C. A perfect, healthy and virtuous snack with an after work glass of wine. 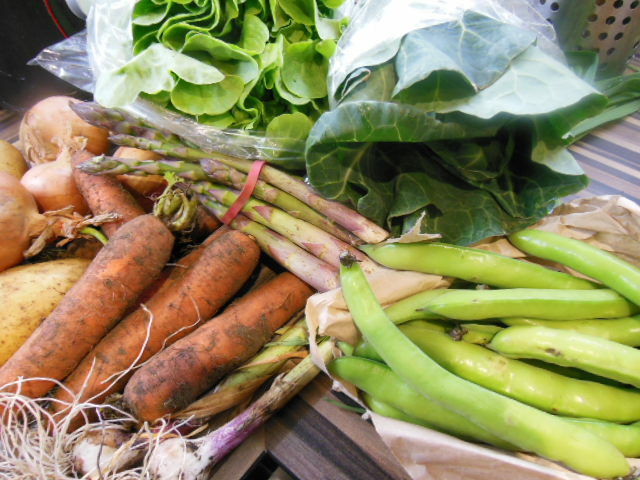 This week we got the basics – pots, onions and carrots, then an oakleaf lettuce; spring garlic and broad beans from the Chingford allotment; asparagus from Woodlands farm, Lincs and spring greens from the Growing Communities, Dagenham starter farm – you can follow Sarah Green on Twitter. We really enjoyed our broad bean and asparagus salad with spring garlic and a mustard vinaigrette. Organiclea also have a market stall outside Hornbeam cafe, 458 Hoe Street (corner of Bakers Avenue, near Bakers Arms junction) on Saturdays 10am-3pm. They sell seasonal fruit and vegetables, local freshly made bread, jams, Walthamstow honey and chutney and local cider vinegar. They have another stall in Leytonstone every Saturday at St John’s Church, Church Lane. This entry was posted in Shopping in E17 and tagged Chingford, e17, hornbeam cafe, local, organic, organic vegetable stall, OrganicLea, Sarah Green, Vegetable, Vegetable box scheme, Walthamstow, Walthamstow yellow cress. Bookmark the permalink.